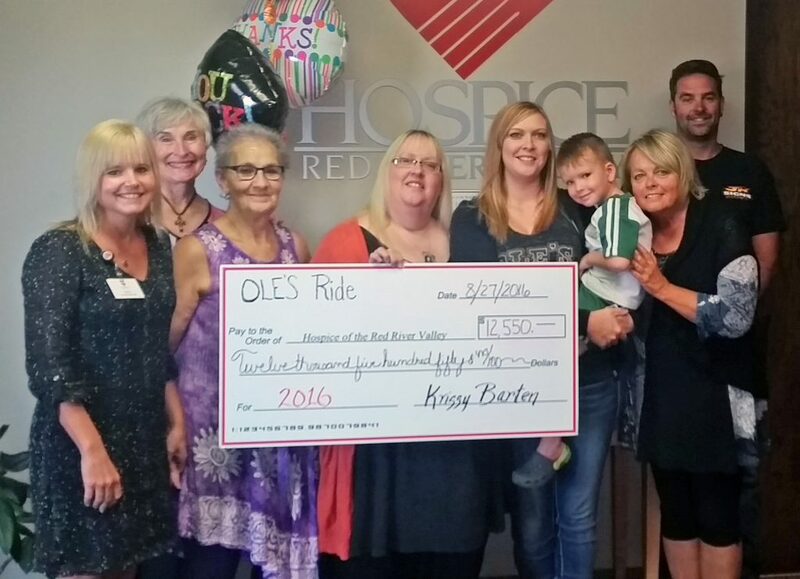 Ole’s Ride was held Aug. 27, 2016, and raised $12,550 to benefit Hospice of the Red River Valley. In seven years, Ole’s Ride has raised $60,000 to help provide hospice care to patients and families in Vergas and the surrounding area. Left to Right: Traci Elshaug —HRRV, Lauryl Ivers—HRRV, Kathy Wouters, Kris Barten, Jessica and Jase Sonnenberg, Jane Bartholomay—HRRV and Justin Helmke. The event started on Friday night with a bike show where riders pre-registered. The ride kicked off from Billy’s Corner Bar and Grill in Vergas, and concluded with a silent auction and music by the Fat Cats. Prior to the start of the ride, Ole’s brother, Tom Barten, performed a sage blessing over the riders and sang the national anthem. More than 100 registered motorcycles participated in the 140-mile ride through Minnesota lakes country. In addition, countless people took part in the various events throughout the day, either as riders, volunteers, road guards or other participants. “It’s very touching to see so many individuals and businesses pull together to honor Ole, and support Hospice of the Red River Valley. We are so thankful to everyone who helped make the 2016 Ole’s Ride such a success,” Jane Bartholomay, development officer with Hospice of the Red River Valley, said.